Simply unfold the PXC 500’s ear cups away from the headband and twist them outward in place to power on, then twist them gently inward until they click for powering off. Sennheiser has done an admirable job of integrating all these features into a product that’s comfortable to use and stylish to wear. 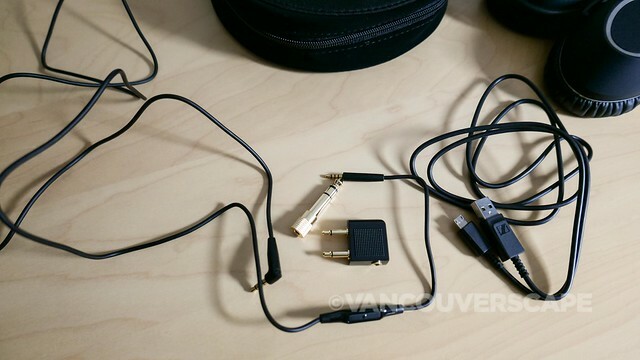 The headphones include an audio cable with one-button mic/remote, USB cable with micro-USB connector, in-flight adapter, 3.5 m to 6.3 mm adapter, quick guide and safety guide. Downloading the PDF manual via the Sennheiser site is a much better plan, as the quick guide is a series of pictograms not always clear for setting up the headphones. Sennheiser’s next generation of wireless headphones include Bluetooth 4.2, utilizing the fastest and energy-efficient standard available. There are two ways to pair the headphones: NFC scanning via your smartphone and via pressing the headphone’s Effect Mode Control button for four seconds. My phone (iPhone 6) preferred the latter method. A friendly female voice (with a UK accent) lets you know once the headphone’s been paired, otherwise you’ll hear the “no device found” prompt. Default English voice prompts can be replaced with French, German, Spanish, Chinese (Mandarin), Japanese, Russia and Korean. 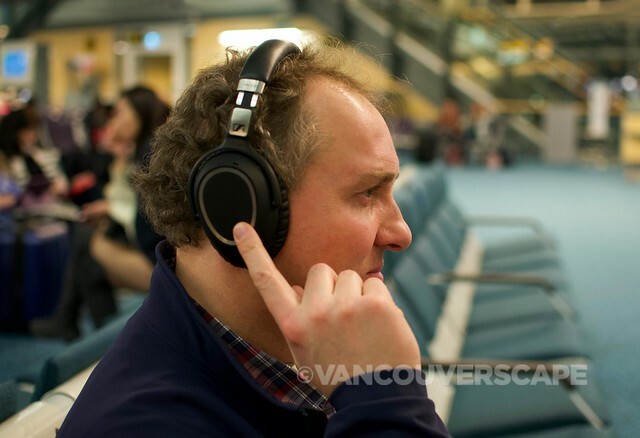 Sennheiser’s created an adaptive noise-cancellation technology to work according to the intensity of ambient noise. There’s three modes to this option: On, Off or Adaptive (which you can then further control via the CapTune app, available for both iOS and Android). It doesn’t matter whether you’re connected wirelessly or via an audio cable, you can always select NoiseGard. Another NoiseGard feature lets you talk through while playing music or receiving phone calls without having to remove the headphones. Four choices here, controlled via the Effect Mode Control button: Off, Movie, Club (best for music) and Speech (podcasts, audiobooks). Director mode is another effect that can be configured within CapTune as well, for adding boost, spacial, reverb and DLC (Dynamic Level Control). Sennheiser’s VoiceMax technology is great for enhancing sound quality during phone conversations and can be activated/deactivated via the Effect Mode Control button and CapTune. Both earpieces contain two microphones for noise cancelling (one on the outside for feed-forward noise-cancelling, one inside the ear cup for feedback noise-cancelling). Through the CapTune app, you’re able to take your listening to the next level through several sound effect options. Intuitive adjustment controls (Equalizer, Soundcheck, Presets) can add a new aural dimension to your fave playlists. Within CapTune, you can also stream music apps as well as customize a profile for reloading previously configured playlists and sound settings. I played around with the SoundCheck screens for richer, deeper output. These can also be saved as a custom profile for repeated use. Connecting the headphones to a computer with the provided USB cable allows the built-in lithium polymer battery to charge automatically. 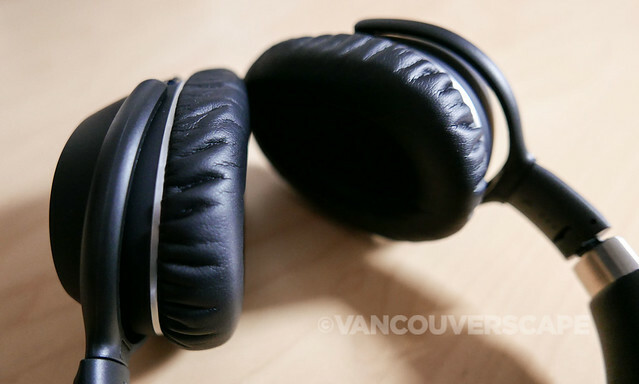 The headphones are geared to last up to 30 hours on a single charge with active noise cancellation connected via cable (note that using Bluetooth reduces the overall time). You can check to see how much battery percentage is remaining by tapping and holding the touch pad for about four seconds after which the nice lady will let you know in 20% increments from “More than 80% battery left” to “Recharge headset”. This is by far the most advanced series of options. By swiping on the right ear pad, you can control the next track in a playlist, fast forward, rewind, or play the previous track. You can also mute or unmute the microphone by swiping left or right during a call. Incoming calls can also get transferred between headphones and smartphones by pressing on the pad. If your smartphone supports redial, you can press and hold to initiate or cancel redial. Voice dialling is possible except when playing music or making calls via swiping backward on the touch pad and holding. Flight mode is easily achieved via either deactivating Bluetooth on the headphones or using the audio cable to listen to your tunes. Switch to NoiseGard to avoid aircraft and ambient noise during flights. In fact, Bluetooth is automatically deactivated when the audio cable is plugged into the headphone’s audio input. When using the aircraft’s in-flight entertainment system, a cool feature takes over: the PXC 500 headphones eliminate the volume jump when the sound source switches. Nice if you’re trying to take a nap and there’s an unexpected PA announcement. The headphones come with a 2.5 mm jack for connecting to your smartphone’s audio output. We found that the NoiseGard function dramatically decreases the airplane engine and airco noise. 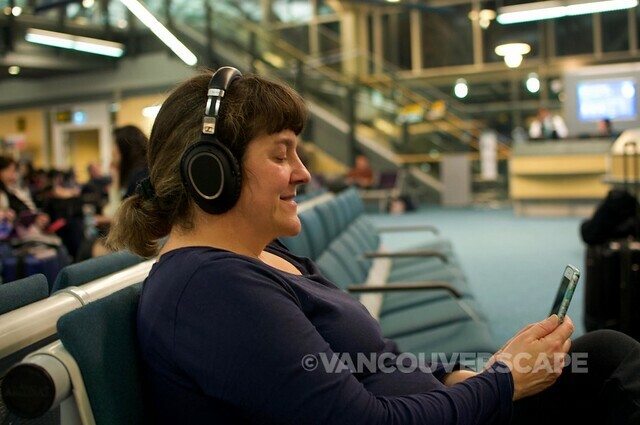 Listening to music or viewing a movie on an iPad using this headset’s Bluetooth connection is a breeze and you can completely immerse yourself in the aural experience. These wear well over time and feel good and snug around the ears. The headphone’s headband mechanism clicks and locks into place, then collapses down and feels solid when doing so. Opening and closing, together with the voice prompt, are flawless. The headphones know when to power on or off based on the two-click operation of each. Just make sure to rotate them correctly in order for them to power off. The cushioned pads are comfortable and when on the head really make you feel as though you’re escaping the outside world. And then there’s the distance from my iPhone to the PXC 500’s: on one occasion, I put the headphones on and touched the play button. In the next room, a good 40 feet away, the iPhone’s music library started playing the next song in queue. I had no idea the Bluetooth range was that powerful. Sound quality appears to be even and voices during phone calls are crystal clear compared with other headphones I’ve used in the past. Comfort-wise, they’re a tiny bit snugger than the Bose QC25’s but are similar in fit. The included semicircular-shaped zippered clam shell case stores the headphones along with a mesh pocket for cables and in-flight adapters. A small quibble: I wish the spine had a built-in carry handle for easy grabbing. 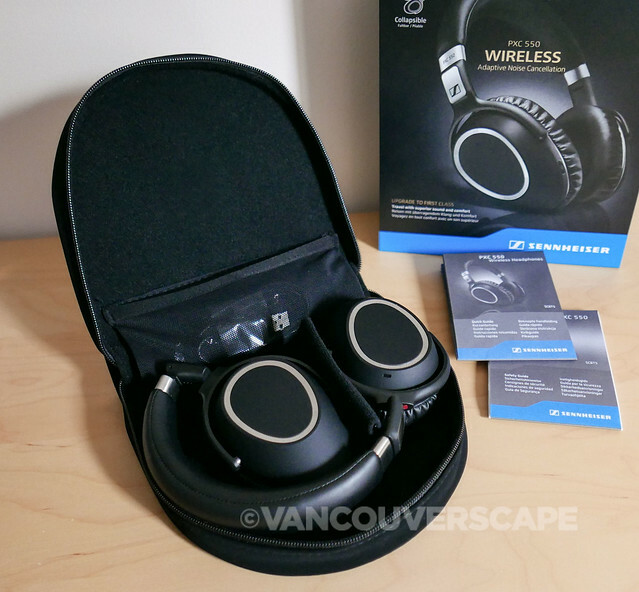 One of Sennheiser’s latest headphones in their lineup, the PXC 500 is compatible with both Apple and Android devices (via Bluetooth and the CapTune app), comes with a one-year warranty and retails for US $399.95 (online and CAD $399.99 via Best Buy Canada). Non-watermarked images courtesy of Sennheiser. I received the PXC 500 wireless headphones to test drive for this feature. Opinions, as always, are my own.